The exocrine main lacrimal gland is located in the superotemporal orbit in a shallow lacrimal fossa of the frontal bone. It is surrounded by fibrous tissue that is attached superiorly to the frontal bone periosteum. In the adult, the lacrimal gland measures 20 mm by 12 mm by 5 mm and weighs approximately 0.78 g. It is incompletely divided by the lateral horn of the levator aponeurosis into a larger orbital lobe, which comprises 60% to 70% of its total mass, and a smaller palpebral lobe below.1,2 The two lobes are connected by vessels, nerves, and the lacrimal ducts. The orbital lobe lies posterior to the orbital septum and preaponeurotic fat, and anterior to the levator aponeurosis.1 With increasing age, the gland may herniate through a weakened orbital septum, resulting in fullness of the lateral upper eyelid. The palpebral lobe is located posterior to the levator aponeurosis in the subaponeurotic space and directly anterior to the conjunctiva, which is adherent to the posterior aspect of the gland. Medially, Müller's muscle may intervene between the posterior gland and the conjunctiva. Anteriorly, the palpebral lobe may extend beyond the orbital margin to lie in the superolateral fornix, where it may be visible through the conjunctiva with eyelid eversion. The lacrimal gland is divided into numerous lobules, separated by interlobular fibrovascular connective tissue. Each lobule is structurally composed of the acinar unit and the ductal system. Two to six secretory ducts from the orbital lobe of the lacrimal gland pass through the palpebral lobe or along its fibrous capsule, joining with ducts from the palpebral lobe to form 6 to 12 tubules that empty into the superolateral conjunctival fornix 4 to 5 mm above the tarsus.3,4 Excision of the palpebral lobe may therefore interrupt drainage from the orbital lobe. The ducts, lined by pseudostratified, nonkeratinizing squamous epithelium, form a branching pattern within the lacrimal gland. Secretion from the acinar units first drains into the smaller intralobular ducts, proceeds through the larger interlobular ducts, and eventually passes into the main excretory ducts before draining into the superolateral conjunctival fornix. The surface of the ductal lumina contains microvilli, similar to the acinar secretory cells.5,6 The epithelial walls of the larger ducts contain three to four layers of columnar or cuboidal cells, compared with a single layer in the smaller intralobular ducts. Each acinar unit, or secretory unit, of the lacrimal gland is composed of an inner layer of columnar or pyramidal-shaped secretory cells around a central lumen, and a surrounding basal layer of myoepithelial cells. The nucleus is located at the base of the acinar secretory cell, and numerous membrane-bound zymogenic secretory granules are present in the apical cytoplasm.7 The number and size of granules, which contain predominantly serous proteins for secretion, vary from cell to cell. Typically, larger granules are located in the peripheral lobules.6,8 The zymogenic secretory granules fuse with the apical cell membrane and release their granular contents into the acinar lumen through a mechanism known as emiocytosis.5,6,9 Myoepithelial cells are spindle- or basket-shaped cells, composed of cytoplasmic myofilaments, located between the base of the secretory cell and the basement membrane of the acinar unit.7 Contraction of the myoepithelial cells helps drive secretions into the drainage tubules and ducts. Like the main lacrimal gland, the accessory lacrimal glands are also innervated. Parasympathetic and sympathetic nerves have been identified in accessory lacrimal glands of humans.11–14 The presence of nerves suggests that secretion from accessory lacrimal glands is neurally regulated. Therefore, the accessory lacrimal glands can also contribute to stimulated tear secretion. The lacrimal gland receives innervation from cranial nerves V and VII, as well as from the sympathetics of the superior cervical ganglion.15 The lacrimal branch of the ophthalmic division of the trigeminal nerve carries sensory stimuli from the lacrimal gland, with the cell bodies located within the Gasserian ganglion. Afferent sensory fibers exit the posterior aspect of the lacrimal gland, travel along the superior border of the lateral rectus muscle, and exit the orbit through the superior orbital fissure. Postganglionic sympathetic nerves, arising from the superior cervical ganglion and internal carotid artery plexus, arrive with the lacrimal artery branch of the ophthalmic artery. Sympathetic nerve fibers also arrive along with parasympathetics in the zygomatic nerve. The zygomatic branch of the maxillary trigeminal nerve gives off the lacrimal branch before dividing into zygomaticotemporal and zygomaticofacial branches. This lacrimal branch anastomoses with the lacrimal nerve of the ophthalmic trigeminal nerve or travels along the periorbita to independently enter the gland at its posterolateral aspect. 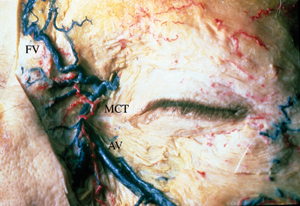 The lacrimal gland receives arterial supply from the lacrimal artery of the ophthalmic artery, with contributions from the recurrent meningeal artery and a branch of the infraorbital artery. The arterial supply enters the posterior aspect of the gland and eventually continues anteriorly as the arterial arcades of the eyelids. The venous drainage follows approximately the same intraorbital course of the artery and drains into the superior ophthalmic vein and cavernous sinus. Lymphatic channels in the interstitial tissue between the gland lobules join the lymphatic drainage from the lateral eyelids and conjunctiva to empty into the preauricular lymph nodes. The lacrimal gland secretes water, electrolytes, and protein in response to neural and hormonal stimulation and is the major contributor to the aqueous portion of the tear film with additional contributions from the accessory lacrimal glands, the cornea, and the conjunctiva.21 Thus, the lacrimal gland is extensively innervated with parasympathetic, sympathetic, and sensory nerves. Parasympathetic nerves, containing acetylcholine (ACh) and vasoactive intestinal peptide (VIP), and sympathetic nerves containing norepinephrine, are potent stimuli of lacrimal gland secretion.21 In addition, many hormones from the hypothalamic-pituitary-gonadal axis have significant influences on the lacrimal gland, including stimulating secretion of secretory immunoglobulin A (SIgA).22–24 Sensory nerves are the least prevalent and release substance P and calcitonin gene-related peptide. 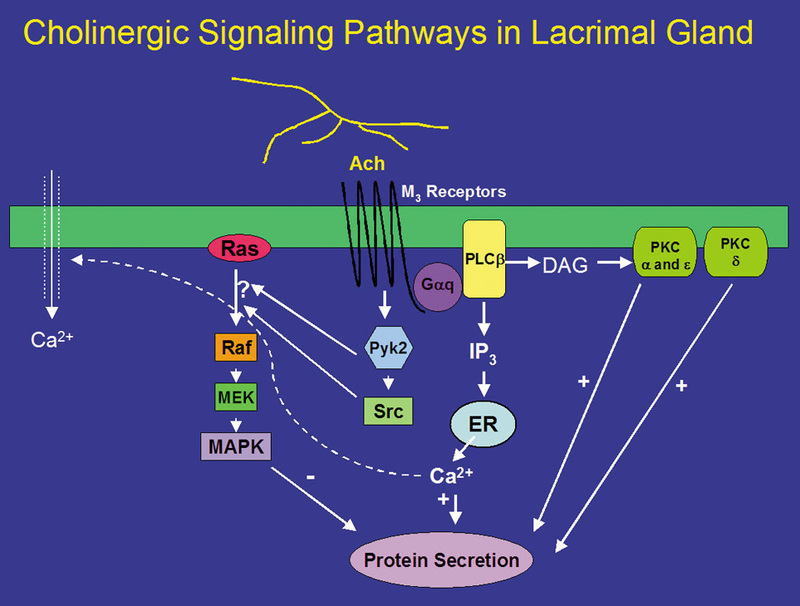 In the lacrimal gland, each of these agonists bind to specific receptors on the acinar cells and initiate a different cascade of intracellular events, or cellular signal transduction pathway. Stimulation of sensory nerves in the cornea or conjunctiva carries the afferent limb of the tear reflex arc, and the efferent parasympathetic and sympathetic nerves subsequently stimulate lacrimal gland secretion. The lacrimal gland consists of three main types of cells: acinar, ductal, and myoepithelial cells. Plasma cells, lymphocytes, macrophages, and mast cells are also present. Myoepithelial cells are basket-shaped cells that surround the acinar cells. Because of the abundance of α-smooth muscle actin present in these cells, it is believed that they are involved in contraction to expel the secretory product. In support of this hypothesis, these cells have been shown to express several neurotransmitter receptors.25,26 Ductal epithelial cells form the lacrimal ducts and modify the secretory product as it moves through the ducts. The acinar cells are the predominant cell type in the lacrimal gland and make up approximately 80% of the cells in the gland. These cells form the secretory unit of the gland termed an acinus. In cross-section, acini are seen as a ring of pyramidal-shaped cells joined by tight junctions on the lateral side.21 The presence of tight junctions results in the formation of highly polarized cells and division of the plasma membrane into apical membranes (membranes bordering the ducts), lateral membranes (membranes between adjacent cells), and basal membranes (membranes that are exposed to extracellular matrix and blood supply). 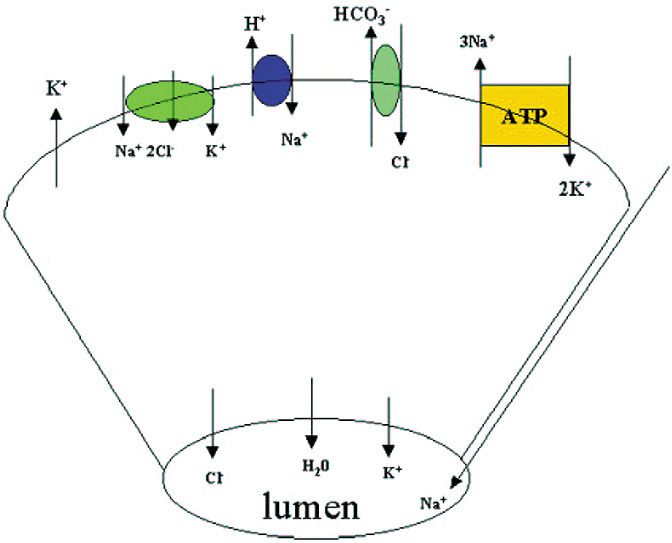 This formation ensures unidirectional secretion of the secretory product toward the ductal lumen. Receptors for hormones and neurotransmitters are located on the basolateral membranes. Once activated, the signal from these receptors is transduced through the cell leading to fusion of secretory vesicles with the apical membrane to release their contents into the ducts. Ductal cells modify the secretory product before it is released onto the ocular surface. Electrolyte concentration of the secreted lacrimal gland fluid varies with flow rate, with hypertonic fluid produced during low flow rates and isotonic fluid at faster flow rates.27 The secretion of electrolytes and water into the lumen is dependent on the activation of ion transport proteins and ion channels also located in the apical and basolateral membranes. The lacrimal gland is able to secrete proteins by two different processes, each of which is regulated differently. In the first process, known as constitutive secretion, the proteins are synthesized in the endoplasmic reticulum, modified in the Golgi apparatus, and sorted into secretory vesicles. These vesicles immediately fuse with the apical membrane.22–24 These vesicles are not stored; thus, regulation of constitutive secretion occurs at the level of protein synthesis. An example of a constitutively secreted protein is SIgA. The second type of secretion is called regulated protein secretion. In this type of secretion, the proteins are synthesized in the endoplasmic reticulum, modified in the Golgi apparatus, and packaged into secretory vesicles. These vesicles are stored until the appropriate stimulus, such as the release of neurotransmitters from nerves, occurs, at which time they fuse with the apical membrane. The lacrimal gland secretes in a merocrine fashion, that is, only a small portion of granules fuse on stimulation. Clinically, tear secretion from the main lacrimal gland may be stimulated by reflex tearing from stimulation of the conjunctiva and cornea by irritating phenomena, psychogenic tearing, or aberrant regeneration. Reflex tearing may also occur by stimulation of the retina and optic nerve by bright light, and by spicy foods because of a reflex arc between the gustatory and the lacrimal nucleus. In psychogenic tearing, strong emotions and stress cause afferent pathways from the frontal lobe, basal ganglia, thalamus, and hypothalamus to interact with the lacrimal nucleus.28 Regeneration of injured parasympathetic secretomotor fibers destined for the salivary glands may aberrantly innervate the lacrimal gland, resulting in crocodile tears, or frank epiphora with gustatory stimulation. These stimuli affect the reflex tear production from the main lacrimal gland, with the continuous basal tear secretion from the accessory lacrimal glands, conjunctival goblet cells, and sebaceous glands all left unaffected. In summary, cholinergic agonists bind to M3 muscarinic receptors to activate PLC. PLC hydrolyses PIP2 to produce 1,4,5-IP3 and DAG. 1,4,5-IP3 increases [Ca2+]i, whereas DAG activates PKCα, δ, and ε. Thus, activation of protein secretion stimulated by cholinergic agonists uses at least three PKC isoforms along with Ca2+ to stimulate protein secretion (Fig. 1). In addition to VIP, two other peptide hormones, α-melanocyte-stimulating hormone (α-MSH) and adrenocorticotropic hormone (ACTH) stimulate lacrimal gland protein secretion.62 These peptides are not released from nerves, but are delivered by the blood supply to the lacrimal gland. α-MSH and ACTH stimulate protein secretion by activation of the cAMP-dependent pathway. Only the melanocortin 5 receptor, which can bind both α-MSH and ACTH, has been identified in the lacrimal gland.63,64 This receptor could mediate the effects of both hormones in the lacrimal gland. 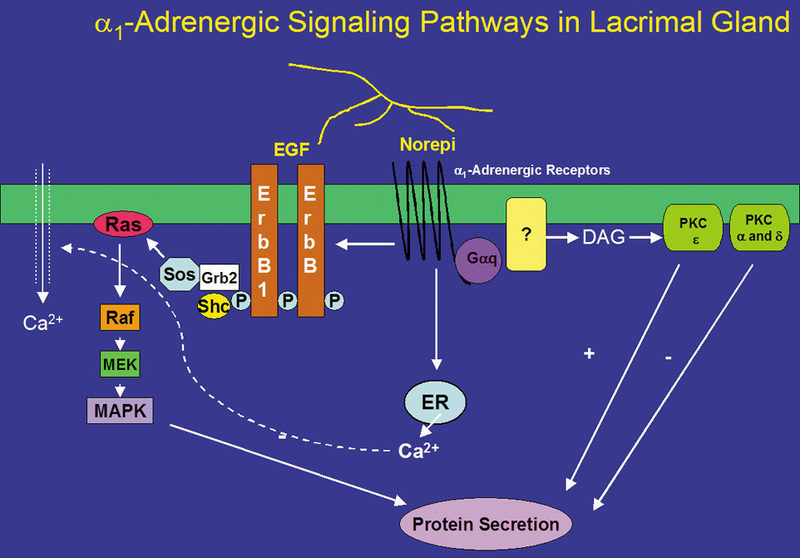 Norepinephrine, the neurotransmitter released from sympathetic nerves, stimulates lacrimal gland protein secretion.65,66 Norepinephrine can bind to both α- and β-adrenergic receptors present in the gland. 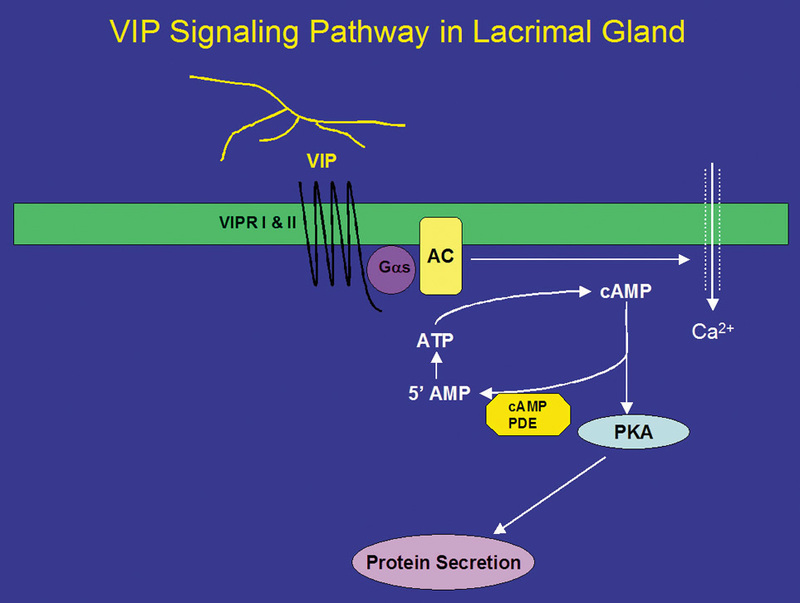 Activation of β-adrenergic receptors causes an increase in protein secretion, which appears to occur through the cAMP-dependent pathway67 similar to the VIP pathway shown in Figure 2. Like cholinergic agonists, α1-adrenergic agonists have also been shown to influence protein secretion by PKC. Down-regulation of PKC with phorbol esters, however, increased α1-adrenergic agonist-induced protein secretion.72 By using inhibitors specific to PKCα, δ, and ε, Zoukhri et al showed that inhibition of PKCα and δ increased α1-adrenergic agonist-induced protein secretion, and that inhibition of PKCε decreased this secretion.53 These results suggest that α1-adrenergic agonists activate PKCα, δ, and ε, but only PKCε stimulates α1-adrenergic agonist-induced protein secretion whereas PKCα and δ inhibit it (Fig. 3). Thus, muscarinic and α1-adrenergic receptors used the same PKC isoforms but in different ways to control protein secretion. This suggests that cellular localization of PKC, through anchoring proteins, is vital for agonist-induced protein secretion. Growth factors, such as the epidermal growth factor (EGF) family of growth factors, have been identified as stimuli of protein secretion from the lacrimal gland.73 This family includes EGF, transforming growth factor (TGF)-α, heparin-binding EGF (HB-EGF), heregulin, and other members of its growth factor family. These molecules are synthesized as transmembrane precursor molecules that are proteolytically cleaved to the soluble pro-form of the growth factor. For EGF, it is further cleaved to the mature form. 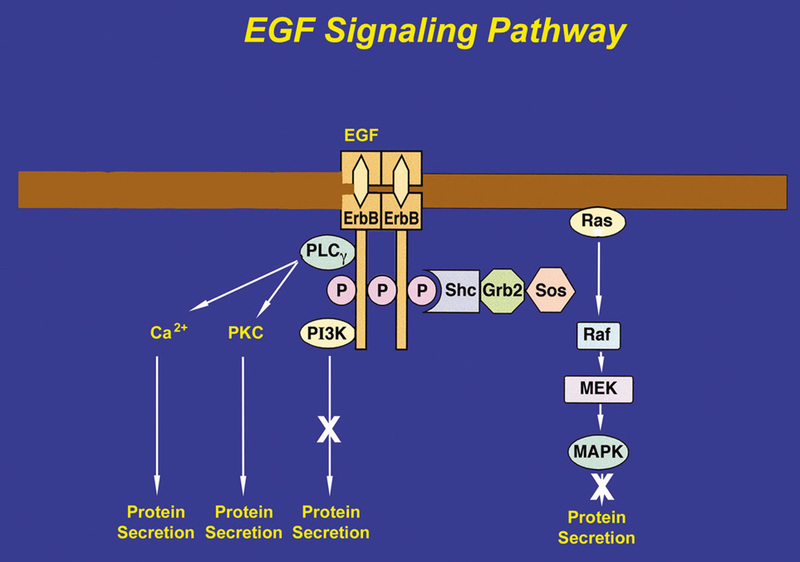 The transmembrane precursor molecule and the pro- and mature forms are catalytically active and capable of binding to the EGF receptor subtypes. Proteins secreted through the constitutive pathway are secreted shortly after synthesis rather than being stored in secretory vesicles. The regulation of this secretion lies at the level of gene transcription and translation. SIgA and secretory component (SC) are examples of proteins secreted by this pathway. SIgA is composed of IgA and a J chain coupled to SC. SC is synthesized in the acinar and ductal cells, whereas IgA and the J chain are synthesized by plasma cells present in the lacrimal gland.22 SC is synthesized as a precursor molecule, known as the polymeric immunoglobulin receptor, which inserts into the basal and lateral membranes. IgA binds to this receptor and is endocytosed into distinct vesicles that are transported directly to the apical membrane. These vesicles fuse with the apical membrane releasing SIgA into the lumen. The lacrimal excretory system begins with a 0.3-mm opening on the medial portion of each eyelid, termed the punctum.3,87 Because of more rapid growth of the maxilla compared with the frontal bone during embryologic development, the lateral migration pulls the inferior canaliculus laterally.88 This results in the lower eyelid punctum to be located approximately 1.0 mm lateral to the upper eyelid punctum.89 Both puncta are directed posteriorly to appose the lacrimal tear lake. Causes such as horizontal eyelid laxity, disinsertion of the inferior retractors from the tarsus, cicatricial shortening of the anterior lamella of the medial eyelid, or trauma may interfere with the precise apposition of the puncta to the lacrimal lake, and thus affect normal functioning of the excretory system. The punctal opening widens into the ampulla, which is 2 mm in height and directed perpendicular to the eyelid margin, before making a sharp turn into the canaliculi. The ampulla, with a diameter of 2 to 3 mm, is the widest part of the proximal drainage system, and thus a common site for formation of dacryoliths. Fig. 6. Approximate dimensions of the lacrimal excretory system. BE, bulla ethmoidalis; IT, inferior turbinate; MS, maxillary sinus; MT, middle turbinate. Fig. 7. 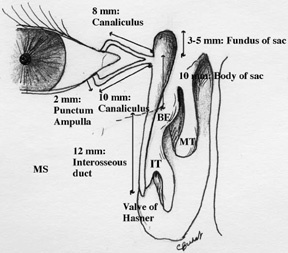 Relationship of the right medial canthal tendon to the nasolacrimal sac: A. Diagrammatic illustration. B. Anatomic dissection. The thick anterior limb of the medial canthal tendon wraps along the anterior upper half of the lacrimal sac to insert onto the anterior lacrimal crest, and the thin posterior limb passes behind the sac to insert onto the posterior lacrimal crest. The upper eyelid tarsus is much greater in height than the lower eyelid tarsus. IO, inferior oblique muscle origin; LCT, lateral canthal tendon; MCT-a, medial canthal tendon-anterior limb; MCT-p, medial canthal tendon-posterior limb; NLS, nasolacrimal sac; SN, sutura notha; T, tarsus. The superior and inferior canaliculi merge to form a common canaliculus before entry into the nasolacrimal sac in more than 90% of individuals.3,92 In a study using digital subtraction dacryocystograms, the common canaliculus was present in 94% of lacrimal drainage systems. 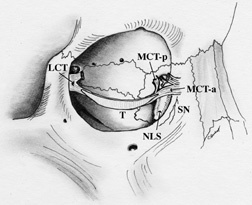 The upper and lower canaliculi join at the lacrimal sac wall without a common canaliculus in an additional 4%, with only 2% of systems having completely separate drainage of the upper and lower canaliculi into the lacrimal sac.93 The opening of the common canaliculus into the lacrimal sac is known as the common internal punctum, which should be free of any mucosal membrane or stricture for success of dacryocystorhinostomy surgery. The functional valve between the common canaliculus and the lacrimal sac has traditionally been attributed to the valve of Rosenmüller, although some studies have been unable to document this structure.94 Tucker demonstrated that the canaliculi consistently angle posteriorly en route to the lacrimal sac.95 The canaliculi then bend at the canaliculus-common canaliculus junction at an angle of 118 degrees, before passing anteriorly to enter the lacrimal sac at an acute angle of 58 degrees. This consistent angulation may contribute to a valve-like effect that prevents retrograde flow of tears from the lacrimal sac. In addition, the lacrimal sac is wrapped by the thick anterior and thin posterior limbs of the medial canthal tendon. The structure of the medial canthal tendon has been described as having superior and inferior crura that arise from the tarsal plates. The crura combine to form the medial canthal tendon that then divides into a thicker anterior limb that wraps along the anterior upper half of the lacrimal sac before inserting onto the anterior lacrimal crest, and a very thin posterior limb that passes behind the sac to insert onto the posterior lacrimal crest (Fig. 7). The posterior limb helps maintain the position of the medial canthus in instances of traumatic or surgical disinsertion of the anterior limb. 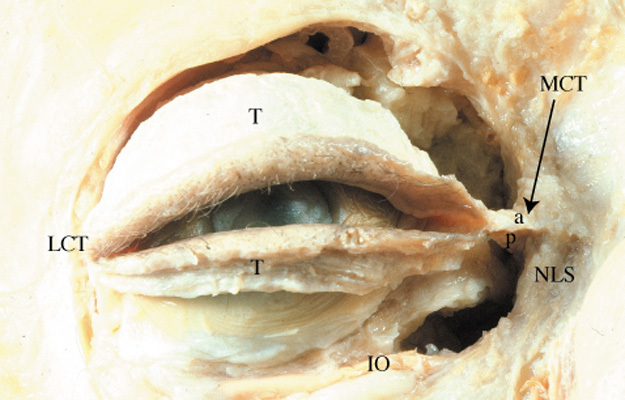 Anatomic dissections have also demonstrated a superior supporting branch of the tendon that courses superiorly to insert onto the frontal bone periosteum at the superomedial orbital rim.97 Below the anterior limb, the inferior portion of the lacrimal sac is bound anteriorly only by the orbital septum, which also inserts onto the anterior lacrimal crest. A distended sac may herniate initially through this thinner inferior septal lining. Fig. 8. Bony anatomy of the lacrimal sac fossa and medial orbital wall, right orbit. 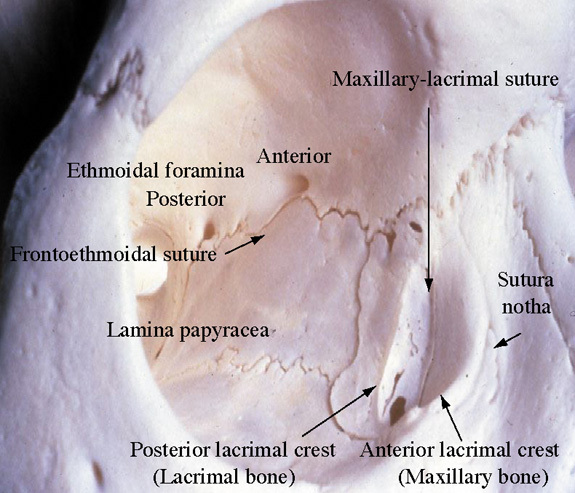 The anterior and posterior lacrimal crests are formed by the maxillary and lacrimal bones, respectively. Fig. 9. Anatomic dissection of the lacrimal drainage system within the bony wall between the nasal cavity and maxillary sinus. The nasolacrimal duct drains into the inferior meatus. 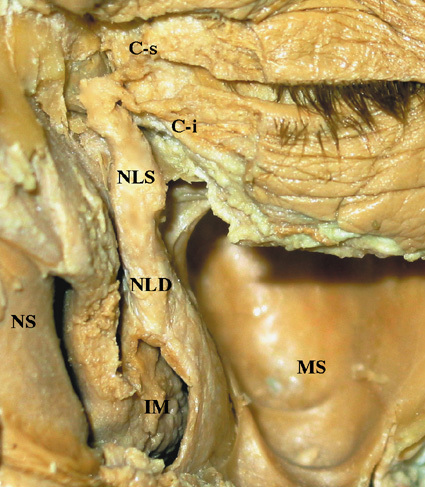 C-i, inferior canaliculus; C-s, superior canaliculus; IM, inferior meatus; MS, maxillary sinus; NLD, nasolacrimal duct; NLS, nasolacrimal sac; NS, nasal septum. When the nasolacrimal duct ostium is obstructed, the duct and sac distend with accumulated fluid. Distention of the intraosseous duct is limited to a diameter of 4 mm because of the rigid bony walls of the canal, with necessary compression of the lymphatic and venous plexi surrounding the duct. The lacrimal sac, in contrast, is not restricted by bone, and may expand laterally and anteriorly. Distention of the sac initially occurs inferiorly, because the medial canthal tendon surrounds the superior half of the sac. The vascular supply to the nasolacrimal drainage system is composed of contributions from the ophthalmic artery, angular artery, infraorbital artery, and internal maxillary artery. The ophthalmic artery courses anteromedially within the orbit after passing over the optic nerve to become the dorsal nasal artery. The dorsal nasal artery gives rise to the superior medial palpebral arteries that supply the lacrimal sac. The facial artery crosses the mandible diagonally and runs along the line of the nasojugal skinfold to become the angular artery. The angular artery passes deep to the orbicularis oculi muscle and superficial to the medial canthal tendon, with the angular vein immediately lateral to the artery (Fig. 10). Both vessels are located approximately 5 mm anteromedial to the anterior lacrimal crest, or 8 mm medial to the medial commissure of the eyelids.87 The angular artery then perforates the orbital septum above the medial canthal tendon to supply branches to the nasolacrimal sac and duct. The infraorbital artery mainly supplies the inferior sac and upper nasolacrimal duct. The inferior nasolacrimal duct receives its arterial supply from the nasal branch of the sphenopalatine artery, a branch of the internal maxillary artery.87,103 On the frontal process of the maxilla just anterior to the lacrimal sac fossa, a fine groove termed the sutura notha or sutura longitudinalis imperfecta of Weber, runs parallel to the anterior lacrimal crest (Fig. 8).87,96 Small twigs of the infraorbital artery pass through this vascular groove to supply the bone and nasal mucosa. Fig. 10. The angular vein (AV) (blue) and artery (red) are located approximately 5 mm medial to the anterior lacrimal crest. FV, frontal vein; MCT, medial canthal tendon. A fine venous plexus surrounds the nasolacrimal duct, which drains into the angular vein and infraorbital vein superiorly, and into the nasal cavity, the pterygoid plexus through sphenopalatine veins, and the internal maxillary vein inferiorly. Venous drainage continues down into the facial vein, or courses through the superomedial orbit to empty into the superior ophthalmic vein. Lymphatic flow drains into the submaxillary nodes or the deep cervical nodes. Sensory innervation to the nasolacrimal sac is derived from the infratrochlear nerve, which is a terminal branch of the nasociliary branch of the ophthalmic trigeminal nerve. The inferior nasolacrimal duct is also innervated by the anterior superior alveolar branch of the maxillary trigeminal nerve. The amount of tears present on the ocular surface at any given time is a function both of secretion of the components that make up tears and the drainage and evaporation of tears. Although the regulation of tear production has been the subject of extensive studies, the regulation of tear drainage has only recently begun to be understood. Tears secreted by the main and accessory lacrimal glands pass over the surface of the conjunctiva from lateral to medial to reach the puncta. The proper position of the eyelids against the globe and the position of the puncta to the tear lake are important for capillary attraction to draw the tears into the canaliculi. Malposition of the puncta, eyelids, or globe may interfere with this functional relationship. Jones and Wobig104 popularized the lacrimal pump theory, which proposed that contraction of the pretarsal orbicularis muscle fibers during eyelid closure compresses and shortens the canaliculi, pumping tears toward the lacrimal sac. Furthermore, contraction of the deep head of the preseptal orbicularis muscle, which is attached to the lacrimal fascia and sac, results in simultaneous lateral movement of the lateral sac wall. This was thought to generate a negative pressure within the lacrimal sac that draws tears into the sac from the canaliculi. In contrast, other anatomic and physiologic studies90,105–109 have found that a positive-pressure mechanism, rather than a negative-pressure mechanism, is responsible for the lacrimal pump during eyelid closure. Rosengren106 intubated the lacrimal sac through the nasolacrimal duct to measure pressures within the sac, and found that pressure in the lacrimal sac increases with eyelid closure and decreases with eyelid opening. Similarly, Ploman et al105 and Maurice107 measured positive pressures in the lacrimal sac during eyelid closure by intubation through the canalicular system. A single blink may transport more tears than produced by basic secretion in 1 minute, suggesting that the lacrimal excretory system functions far below capacity.107 In other words, the lacrimal sac may not empty with each blink, but accumulates tear fluid until the volume is sufficient to bypass the resistance to drainage through the nasolacrimal duct and valve of Hasner. The volume of tears drained per blink has been measured to be 1.8 μL by Rosengren and approximately 2.0 μL by Sahlin and Chen.106,111 Although the majority of tears drain through the excretory system, 10% to 25% of secreted tear volume may be lost to evaporation under normal conditions.112 A small portion of the tear volume may be absorbed by the epithelial lining of the nasolacrimal sac and duct.56,113,114 Goblet cells and intraepithelial mucous glands located within the epithelium produce a mucous layer covering the distal excretory system.115 In a study by Chavis et al,113 no technetium tracer passed into the nose of one-third of subjects under basal secretion rates, suggesting that tear fluid may be absorbed within the excretory system before reaching the nasal cavity. More recently, it has been shown in an animal model that lipophilic substances are absorbed from the tear fluid by the epithelium of the nasolacrimal duct.116 Lacrimal drainage capacity has also been found to correlate to the blink rate when the nasolacrimal duct is in a horizontal position.111 Gravity may also contribute to increased lacrimal drainage.111 Other factors that assist in tear drainage include capillary attraction by the canaliculi, and the Venturi effect and Bernoulli's principle in the nasolacrimal duct, in which an increase in velocity of fluid flow occurs with a concomitant decrease in pressure. Thale et al56 used histologic, immunohistochemical, and scanning electron microscopic techniques to demonstrate that the wall of the lacrimal sac is composed of collagen, elastic, and reticular fiber bundles arranged in a helical pattern. They proposed that the lacrimal sac distends and is pulled superolaterally because of its medial attachments when the lacrimal orbicularis muscle contracts with blinking. In addition, the helical collagen and elastic fibers encircling the sac may result in the sac being “wrung out” as another mechanism of lacrimal drainage. A vascular plexus has been demonstrated surrounding and within the walls of the nasolacrimal sac, and filling the space between the nasolacrimal duct and its bony canal. This vascular plexus has specialized blood vessels similar to a cavernous body, and is thought to play a role in tear fluid absorption or regulation of tear outflow.10,56,117–119 In a histoanatomic study of the lacrimal drainage system, Thale et al found this plexus of large capacitance vessels to be continuous with the cavernous body of the inferior turbinate.56 By using anatomic dissection and electron microscopy, Paulsen et al118,119 found that the vascular plexus fills more than two-thirds of the bony canal, and hypothesized that swelling and shrinkage of the cavernous plexus regulates tear outflow by controlling the opening and closing of the lacrimal passage lumen. The cavernous plexus swells when the barrier arteries open and the throttle veins close, resulting in filling of the capacitance veins, swelling of the cavernous plexus, and subsequent closure of the lacrimal passage lumen. In contrast, closing the arteries and opening the throttle veins allow the collected blood in the capacitance veins to drain. This shrinks the cavernous plexus and increases the lumen of the excretory passageway. The blood vessels within the plexus have been found to be innervated, which suggests that arterial vasoconstriction and vasodilation by neural regulation may be a factor in the regulation of tear drainage.119,120 Ayub et al120 found a similar function to the vascular plexus in an experiment using an endoscope to observe the transit time of a fluorescein drop through the excretory system. However, they found that there was an ideal degree of cavernous plexus swelling that permitted optimal tear drainage under normal conditions. Excessive swelling of the vascular body would narrow the lacrimal passage lumen and decrease outflow. Similarly, significant shrinkage of the vascular body would dilate the lumen too much such that the mucosal folds of the lumen were too distant to enable optimal drainage. The valve of Rosenmüller or the angulation of the canaliculi may prevent retrograde flow of fluid from the lacrimal sac into the canaliculi. The valve of Hasner at the nasal ostium prevents reflux upward from the nasal cavity into the nasolacrimal duct. As long as the pressure within the nose is less than that within the nasolacrimal duct, the valve remains open. When the intranasal pressure increases, such as during nose-blowing, Hasner's valve closes, preventing air or mucus in the nose from entering the nasolacrimal duct. Epiphora results from anatomic obstruction of the nasolacrimal passages, or from nonobstructive factors such as eyelid malposition, lacrimal pump insufficiency, tear film instability, or primary or reflex hypersecretion. Various tests are available that evaluate nasolacrimal patency, such as dacryocystography, computed tomography, nasal endoscopy, and lacrimal probing and irrigation. Dacryocystography, in which a radiopaque dye is injected into the excretory system and radiographs are taken of the transit of dye through the passages, may be helpful to define the presence and location of an anatomic obstruction from a mass, but is not performed under normal physiologic conditions. Physiologic tests for obstruction include the Jones dye test,3,121 fluorescein dye disappearance,122 saccharin taste test,123,124 and dacryoscintigraphy. Physiologic tests have the advantage of not requiring any instrumentation or injection that distends the lacrimal passageways from exogenous pressure. Therefore, functional rather than anatomic obstruction may be determined in the setting of normal physiologic conditions. The primary dye test was described by Jones in 1962. In this procedure, 2% fluorescein was instilled into the tear film and a cotton pledget placed in the inferior meatus at 5 minutes was evaluated for presence of fluorescein. The fluorescein dye disappearance test described by Zappia and Milder122 measured the disappearance of fluorescein from the tear film as evidence of an intact drainage system. The saccharin test, initially described by Lipsius123 and revised by Hornblass,124 used a 1% saccharin solution in distilled water placed in the inferior cul-de-sac to determine functional patency of the lacrimal system. Ninety percent of patients tasted the sweet solution in the oropharynx by 15 minutes, although the test was ineffective in patients with tasting problems. The fluorescein appearance test125 was another physiologic test that used 2% fluorescein instilled in the cul-de-sac and visualized by ultraviolet light in the oropharynx. The oropharynx was examined every 5 minutes for 1 hour and fluorescein was seen by 30 minutes in 90%.